Prol-Position examine working life and the use of agency staff in railway infrastructure corporation Vossloh. In its official presentation Vossloh prides itself with the long history of the family company: "In 1883 Eduard Vossloh offers the Royal Prussian Railway to produce suspension rings for the track fittings. Being a disabled war veteran he gets the order. The smithy was enlarged and additional iron products, such as curtain rails were produced". Vossloh became a multinational company only in the 1990s, made possible mainly due to the opening of the former Eastern Bloc for foreign capital and the privatisation process of the railways in the East and the West. Vossloh acquired shares and took over various companies active in the production of rail infrastructure or vehicles. 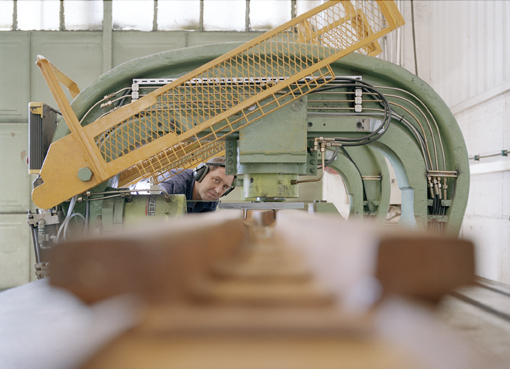 Today Vossloh employs about 4,500 people. The main production locations are in Germany, France, Belgium, the Netherlands, Spain, Great Britain and Poland, as well as branches and joint-ventures in Asia and America. The number of workers in Germany amounts to 1,574, the total in all other countries to 2,966. The total staff is divided into three different company units: 3,050 workers produce rail infrastructure (track parts, switches etc. ), 1,175 people work in the vehicle construction and 283 in the information technology department. In addition to that a lot of temp workers are hired, according to the orders situation (see below). The product spectrum ranges from switches and rail parts produced in Poland, to passenger information systems delivered for the German high-speed trains ICE or the Frankfurt Airport, electrical installations for trams and electro buses ordered by transport companies from various European and North-American cities, to construction of diesel train-engines in plants in Kiel, Germany and Valencia, Spain, which Vossloh took over from Siemens and Alsthom. In the engine-construction minor conflicts occurred when Vossloh took over and the management announced job cuts. The dismissals in Kiel were explained by high steel prices and low demand for diesel engines, all temps were sent home and 180 permanents had to go in March 2005. With the take-over Vossloh also bought the old business relations, e.g. those of the French subsidiary which supplies the Israeli Railways with switch-parts for the last 20 years. It is interesting to see that Vossloh not only bought into the sector but re-combines the newly acquired units on an international level, e.g. for a huge order previous to the Olympic Games, Vossloh in Poland delivered track parts for the public transport in Athens and the plant in Düsseldorf produced the electrical equipment for the new trams. As a supplier Vossloh depends on the main clients and on their flops: Vossloh delivers a company responsible for the maintenance of the Euro-Tunnel, which turned out to be rather unprofitable and supplied equipment for the trams Siemens built for Budapest, which became famous for their construction flaws. All in all Vossloh is said to be on the economic upturn or at least stable, since the beginning of 2000 the Vossloh shares have had an annual revenue of 24 per cent, in 2004 the company achieved an annual turn-over of 922 million Euro, a returns rate (before taxes and interests) of 11.5 per cent. Capital employed 690.2 Million Euro, return on capital employed 15.3 per cent, an investment sum of 39.4 Million, personnel costs 218.9 Million. Kiepe is a medium size company in Düsseldorf, Germany producing electrical equipment, mainly for the electrical propulsion of rail- and road vehicles. The electrical equipment makes up 40 per cent of the total costs of the train or tram production. At the main location in Düsseldorf, Kiepe employs about 450 people, of which 278 are white-collar workers, mainly technicians and engineers, 172 are blue-collar workers and 100 people work in the subsidiaries in Vienna, Milano, Ottawa, Krakow. Kiepe has a tradition similar to Vossloh, having started as a family company and being specialised in a technically quite demanding field with small product series. Unlike Vossloh Kiepe had rather difficult times in the 1990s, the company was bought by various investors and finally ended up as a part of the Vossloh cooperation in 2003. The last example shows that between the award of the order and the actual delivery there are three years of development and production. Kiepe got the order in January 2003 and in December 2005 the company thanked its workers for the first 100 buses by feeding them free cheese rolls. For the Vancouver order Kiepe hired about 70 temp-workers from twelve different temp agencies. The first temps started in July2005 the last went in December 2005. The following description of the daily working-life refers to this period. The plant is divided into three different units: the office bloc for administration and engineering, the mechanical and the electrical work-shop, which includes the quality department and the department for the assembling of the circuit boards. In the two latter departments there are mainly women employed. The final product is a 2 x 4 x 1.5 meter metal box with several thousand electrical connections and electronic parts inside. About 100 people work directly together, producing individual parts of this box and assembling them. They make about eight boxes a day. There are different production teams responsible for single parts, they rivet metal frames or wire relays. There is a so-called cable corner where hundreds of kilometres of cable are cut and prepared for connecting each day. It is quite astonishing how few work steps have been outsourced, how much is still done within the company. This is due to the small series, the frequent changes and adjustments in the run of an order, maybe also due to the low wage level. It is nevertheless surprising that they choose get skilled electricians to assemble little plastic parts and prepare cables day in and day out. The major outsourcing happened in the mechanical department, maybe because the parts are more standardised. The plant is a classic example of intensive labour and big cooperation, there is hardly any machinery in use. Single work-steps are frequently re-distributed amongst the 100 people, the cooperation re-arranged. The single work-steps differ gradually in complexity and importance, so that new or less reliable workers are more likely to get the dull ones. The coordination of the total cooperation is a major task and also implies the control of quality and productivity. With each task you get a sheet with exact times allowed and exact numbers of parts needed along with the wiring plan. If you are supposed to assemble and connect a fan for the box they tell you how much time you are allowed for getting your parts, for assembling them, for preparing your cables, for wiring the whole thing. There is a lot of time pressure, which is eased by missing parts or problems with the total coordination, so that it is difficult for the management to pin down single workers. During the Vancouver order all 70 temps were gathered and the management told us off for being too unproductive and for making too many mistakes. There was an interesting situation in the cable corner, which is quite hidden behind huge scaffoldings with cable drums. About six people work in this corner, often sitting together at a big table, preparing and cutting wires with mechanical tools, there is a low-tech machine which is able to cut cable of smaller diameters. Most of the management's complains about low productivity addressed the cable corner, most of the interesting conversations could be had there, as well, being it about French riots, latest jobs or love stories. At the end of December they brought in a new machine which was able to cut cables of all diameters. By that time about three quarters of all temps had already been sent home and the remaining did not know how much longer their stay would be. The introduction of this new machine instigated some debates. First of all everyone was happy that the machine would do the cutting of 120 mm cable, which avoids painful tendonitis or RTS.1 The next tangible difference is speed: the cutting by machine is about four times faster than by hand. We made some calculations on how long it would take to valorise the investment sum of 30,000 Euro. A negative effect is obvious: one of us now had to stand next to the machine all the time and was not able to take part in the table conversations anymore. The machine was so noisy that chatting became difficult anyway. Finally, and noticeable for everyone was the immediate effect of the increased productivity on our employment at Vossloh: the machine would have reduced the stay of some of us by one week, which meant one week earlier on the dole or cable dragging on the rail tracks between Duisburg and Amsterdam in winter. The work-force is international, only about the half of the workers were born in Germany. There are many Polish workers employed, most of them already for a long time and with permanent contracts. Most of these Polish workers are aged 45 and older, most of them arrived in Germany the early 1990s. Many of them worked in the Polish heavy industries and ship yards, some of them can tell stories from 1980/81, about the Lenin Shipyard in Danzig and its rock-bands, about Solidarnosc-banners being attached to chimneys after the concerts. Other people come from China, Vietnam, the Dominican Republic, Argentina, Turkey, Greece, Yugoslavia, Italy, Romania, Russia, Ukraine. Milan, for example, came from Novi Sad, Yugoslavia to Vossloh in 1973, as an official Gastarbeiter, so-called guest worker. He worked as an engineer, had some difficulties, got bullied and depressed and now drags his handcart with machine parts through the halls. Everyone calls the Chinese woman in the quality control Shaolin, because she is quite strict. When the 1989 revolution took place Daniel from Romania lived in a small village near Arad. Also a lot of German workers have international and migration experiences, mainly the temp workers. Karl worked in China for four years, assembling and installing textile- and photo film machines in Shanghai. Thorsten was sent to shipyards in Singapore and the Netherlands, Christian to Tokyo, repairing machines for Hitachi, Lars for Siemens in France and Belgium. There is a wealth of different experiences, ranging from 33 years working for ABB in Essen, Germany, to working self-employed for the Ford automobile plant in Cologne, repairing complex machines, to mining and working in power plants or the chemical industry. Some worked on airport construction sites, some were in the army on interventions abroad, others did courses as care workers for elderly people. People have experienced globalisation. For example they were employed by a German company to go to china and work setting up the new assembly lines there. When the whole company moved all their production to Shanghai they were laid off again. They opened their own small business, offering their skills to big clients, had to declare themselves bankrupt when the crisis in the car industry kicked in. They have been the praised as the back-bone of German industry, the skilled workers of the core sectors. Now they are on 9 Euro-jobs and do not know if and where they will be employed the next month. They have to take week-end jobs, cash-in-hand building sites or cleaning industrial machines. They have a lot of life experience, some have been in jail, in mental hospitals, are or were drug addicts, violent football fans. They have daughters who were born as sons and they talk openly about it. What they are lacking are experiences of collective struggle. They belong to a generation in Germany which worked in the main industries for thirty years and longer without having been on strike for a single day. At Kiepe there have been two days of short warning strikes in seventeen years. One of the main problems of the permanent staff is the variation of the weekly working-time according to the orders situation. For the duration of the Vancouver order the management enforced a 45-hours week for everyone plus Saturday-shifts for some of the workers. The overtime is converted into paid leave for when there is less to do. Most of the workers had 200 hours overtime on their time-account. Another reason for discontent is the new wage model ERA which is supposed to be introduced in the whole German metal sector by 2007, as a result of collective bargaining. The new wage model requires an individual assessment of each job and its tasks. A lot of people at Kiepe, particularly the women in the circuit board department, fear wage losses. The permanents get about 5 Euro more per hour than the temps, about 14 Euro before taxes. Some of the permanents treat the temps like temporary hands, like a low-wage threat and are annoyed by the additional stress of having to explain the same things to new people again and again. Although it needed asking to find out who was a temp and who permanent, given the equality in numbers and the ever changing job tasks. All in all the atmosphere at Kiepe is said to have worsened over the last years, more stress and time pressure, more emphasis on the dependence on single clients. If you compare the job at Kiepe/Vossloh with work on construction sites or other temp jobs you can say that at least you do not get too dirty and that physically the job is not too tiring. Some of the temps have their third or fourth stay at Kiepe, each year for a four or five month period. That is why no-one hopes for a permanent contract, even the management is honest about it and offers nothing. The fact that the temps count for half of the total staff in production does not lead to collective discussions as to whether there is enough power to demand more money or permanent contracts. Perhaps that is also due to the temps coming from twelve different temp agencies, although most of us had no contact to the agencies apart from sending our weekly hour-sheets. Most of the temps travel a long way to work, often more than 40 kilometres, some 70. The compensation they get from the agencies does not cover the costs. The temps get more or less the same wage, between 9 and 10 Euro/hour before taxes. This slight difference is already an incentive: some temps changed the agency while working at Kiepe during the Vancouver order and managed to get a minimum wage rise. Most of the temps have worked as permanents, mainly for big companies but they do not see the chance to get back to that status. Everyone is annoyed, by low wages, uncertainty, Hartz IV-dole-reform and politics in general. Everyone can tell stories about being fucked over by the agencies, e.g. some have been asked by their agency whether they need a hotel room for a job in Rotterdam or whether a tent would do. Given that most of the agencies pay only 35 Euro per day for hotel and food, a tent does not seem too unreasonable. Some people wanted to form a works council in order to deal with these problems collectively, but finally the active people quit the job. After the wigging we got from the Kiepe management concerning our work performance the atmosphere was really bad. People complained about schizophrenia: on one hand Kiepe demands the same work performance and experience from the temps as from the permanents, on the other hand everyone knows that as soon as the work is done you are fired. Although people knew this fact there was a lot of bad blood when the sacking actually happened. On a Friday in late December 100 trolley buses were completed and the company gave everyone free cheese and ham rolls as a kind of reward. We made jokes about final binge and that we will probably all be on the dole within the next week. Actually a dozen of the temps got their sack already two hours later, at least half of them were also sacked by their agencies on the very same day. It is rather difficult for people to organize actions within short notice, but particularly for the temps that is their only chance. The idea of a go-slow strike came up too late, a great part of the order was already completed, but the connections amongst the temps still too weak for more offensive measures. All in all we have to state the enormous contrast of vast proletarian experiences within the total work-force, a rapid worsening of working conditions and the blatant lack of experiences with collective actions.